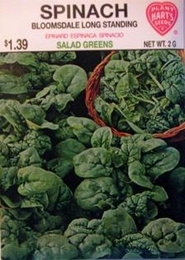 This Spinach has dark-green, deeply savoyed (crumpled) leaves which are tender and delicious. It resists bolting (forming seed stalks) longer than most spinach. Used fresh in tossed salad with other greens as well as steam-cooked to preserve flavor and vitamins. Spinach is a great source of vitamins. Avoid plantings that will mature in the heat of Summer. For Summer crops plant Swiss Chard or New Zealand Spinach as a substitute. 2800 Seeds/oz. Plant 1oz per 100ft row.